I love carrot cake... but it has to be with cream cheese icing. This recipe is delicious (from the reliable Edmond's Cook Book) and has walnuts, cinnamon, crushed pineapple and grated orange rind in the cake, which makes it extra special. Checkout the recipe index to the left of my blog for more yummy things... mmmm... food! Beat eggs until thick. Stir in oil. Sift flour, sugar, baking soda and cinnamon into the egg mixture and combine. Fold in carrots, walnuts, orange rind and pineapple. Grease and line the base of a 23cm ring tin. Spoon mixture into tin. Bake at 180 deg C for 40 minutes or until cake springs back when lightly touched. Leave in tin for 10 minutes before turning out onto a wire rack. When cold ice with Cream Cheese Icing if wished (see below). Beat butter and cream cheese until creamy. Mix in icing sugar and lemon rind, beating well to combine. oh my! I LOVE carrot cake but haven't had it for ages and ages this prompts me to make it - as soon as this heatwave is over and I am game to turn the oven on!!! OMG, that is a mouthwatering cake! oh yum! can I have a slice? I'm halfway through making this (just before you add carrots) and my mixture is really dry. Is that normal? Can't imagine folding anything in. Hi Liesl - yes, mine was rather dry too. The carrots do make it quite wet, so mix it all together and see what you think. Hopefully works out fine - let me know!! I had disaster after disaster! Realised I had used the crushed pineapple so used mushed up tinned fruit... Waiting for it to cool so we can try it! Thanks for the recipe. So far it looks amazing! Oh dear - don't you hate those days!! Hope it turns out great in the end - I'm sure it will!! Hi there, my copy of Edmonds cookbook has 1 tsp of baking powder and 1 tsp of baking soda?? Did everyones cakes turn out ok?? Hi, yes it turned out fine. I don't remember what my Edmond's book says (coz I silly-ly left it in NZ while I am now living in the Czech Republic! )but this recipe worked out just fine. I made this carrot cake a couple times at the start of the year and it was A-mazing!! then i lost the recipe and have been trying to find it for weeks and i found it just now and have made sure to save it to every folder possible! This is my absolute favourite cake recipe. 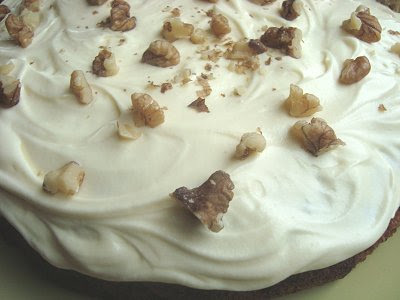 I made this exact recipe back in nz a few years ago and completely forgot it even existed until a few days ago my husband mentioned he had never tried carrot cake before... I jumped online and "WALLLLA" I found the recipe. You've been a great help. Thanks a bunch. The carrot cake is backing in the oven as I type looking scrumptious... Can't wait to chomp it.